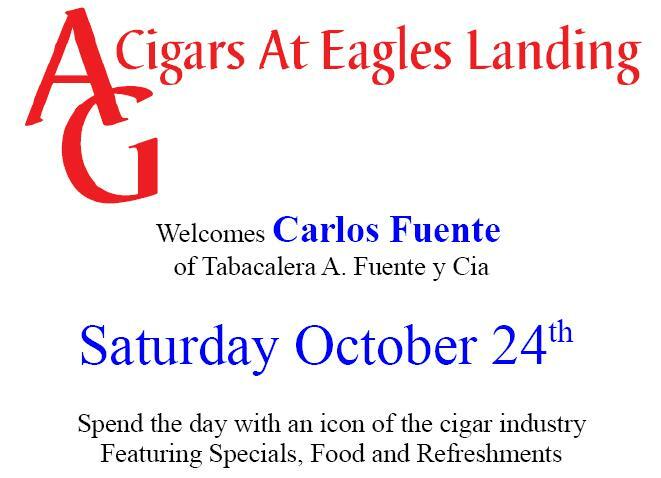 Carlos Fuente Sr will be joining us on Saturday October 24th at the store. Mike has made arrangements for catering, and refreshments will be provided as always. As with any of our events you can expect an unusual selection of cigars that are not readily available. Carlos Fuente is regarded a very down to earth person, with a warm friendly personality. In 1957 at the age of 22 Mr Fuente bought his fathers cigar business in Tampa, Fl. After moving the operation several times over the years he finally settled in Santiago, Dominican Republic. Tabacalera A. Fuente y Cia produces over 40 million cigars each year. Please join us in welcoming this pillar of the cigar industry on the 24th. I will post more details as I get them, and for those of you on the email list I will be sending out reminder emails with more details also.